For my in-laws 40th anniversary party I wanted to do something special. 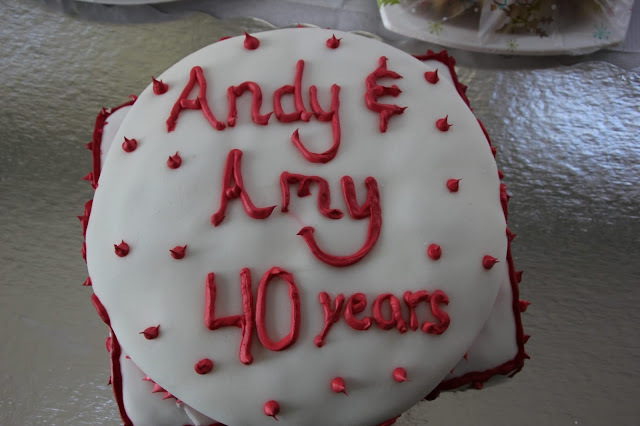 After all, 40 years together is really something to celebrate. Working with fondant is a lot like play-doh. Just have fun. Whatever tiny mistakes are made can very easily be fixed, and chances are you are the only one who will see the imperfections anyway. Bake a cake in the size and shape you desire, let it cool, and cover with a thin layer of frosting. Preferably a light colored frosting, as to not later be concerned about seeing chocolate through your white fondant! Cover your work table in wax paper, freezer paper or a baking mat. I taped the edges of my wax paper to the counter so it would stay in place when it was time to roll the fondant out. First work the ball of fondant you have, to make it a bit less stiff. Make sure you have sugar nearby, adding a pinch to your fondant and hands when it starts to get sticky. Also sprinkle a bit of sugar on the wax paper before you roll out the fondant. Roll out your fondant in all directions until it is paper thin and wide enough to cover the top and sides of your cake. Next lift the fondant onto the rolling pin VERY SLOWLY as to not rip it. And carefully place on top of your cake. 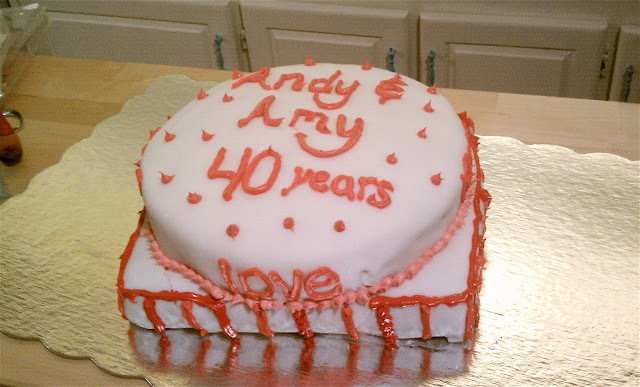 Remove the rolling pin, and, with the palm of your hand, begin to smooth out any bumps that may appear on the cake top. Ease the fondant around the sides of the cake, pressing it in towards the base of the cake. Any extra "material" will create folds that can be smoothed out by simply rubbing with your fingers and a little bit of sugar. Cut the extra fondant away, around the base using a pizza cutter or knife. Knowing I wanted a square bottom for my circular top, I made a rectangular cake, and sliced off the end. I covered my square with fondant in the same way as the top, taking special care at each corner, folding the fondant in. Cake is fully constructed and ready to decorate! Simply leave the fondant covered cake in the fridge for 5 or more hours to let it set. I knew I wanted to decorate this cake in different shades of pinks and reds, so I used a simply vanilla frosting and mixed in different amounts of red food coloring. I take a small ziplock sandwich bag and snip of a VERY teeny piece of one of the corners of the bag, fill it with my frosting and I have a very efficient pastry bag! Making dots is simple, squeezing just a touch and letting go, repeatedly. The essential wedding cake warning, "In my mouth, not on my face".